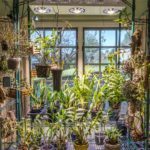 In Part 1 of this article on humidity for orchids, I described how artificially raising humidity has emerged as a new need over recent years in my San Francisco Bay area growing area. After the summer of 2016, I became concerned that one of my larger Vandas was suffering from inadequate humidity, noting the characteristic declining lower leaves. I did NOT want to grow “Vanda popsicles” (vandas with leaves only on the top part of the orchid) and set out to improve conditions for the next growing season. I can say that I am very grateful that I planned ahead for 2017 — we had the hottest and driest summer and autumn seasons that I’ve observed since moving to the Bay Area in 2003. 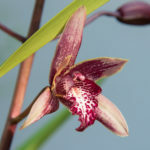 I’m happy to report that all of our orchids are in excellent condition, with high flowering and new growth in-progress as I write this post in early 2018. In my quest for humidity solutions, I can summarize three ways to increase humidity for indoor growing areas: 1) humidifiers, 2) humidity trays, and 3) grouping plants closer together. All of these face the challenge of local moisture dispersing into the drier room environment. If you have a small closed space, then it is easier to contain the moisture and build it up. I find this works well in my cool growing area, which is a 10×12 room. There are lots of plants and lots of evaporation from 4’x4′ water trays — this room will stay around 50% humidity with little additional effort. Also, overnight low temperatures in winter are around 45F (heat vents shut, window open part-way), so it is much less affected by central heating. The real challenge is my main indoor growing area, a semi-circle of six glass doors that is open to the house. No ability to enclose it and a fully open floor plan other than the bedrooms. About as non-ideal for locally raising humidity as you can imagine. 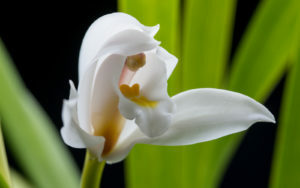 This is where the highland New Guinea dendrobiums live — and they prefer 60%-80% humidity! I’ve tried large ultrasonic humidifiers and these are surprisingly effective turned up to medium — an output of about a gallon of water a day. Using this, I can maintain the humidity year-round at 45-50%, which is quite adequate for most of the orchids … but not up to par for the mounted dendrobiums. While they do fine at 50% humidity for short periods, over the longer run, they grow much better by maintaining higher humidity, with robust root and cane growth, at 60% during the day and higher at night. The solution? Create a standing cloud! 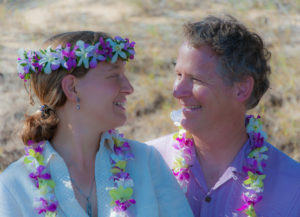 Check out the photo to the right to see what I am describing. How? With a directional humidifier. 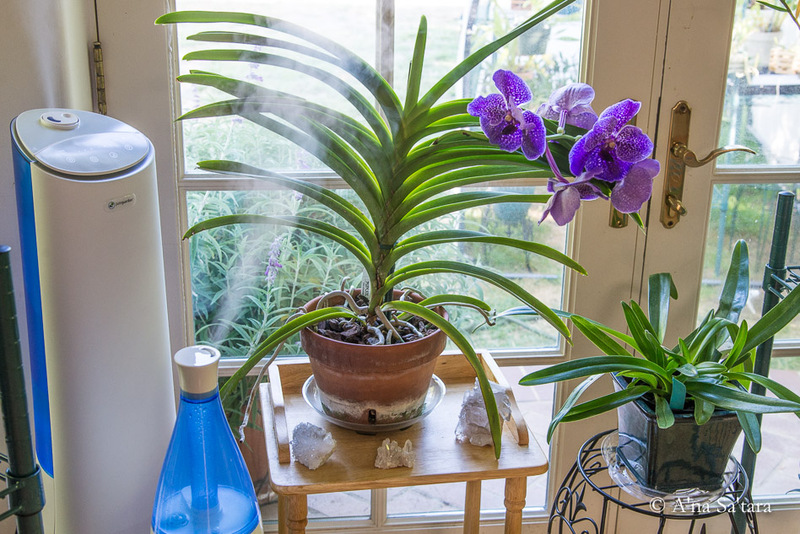 I stumbled on this type of humidifier, made by PureGuardian, when I was trying to direct humidity towards the large Vandas, while still have a French door partway open for ventilation. 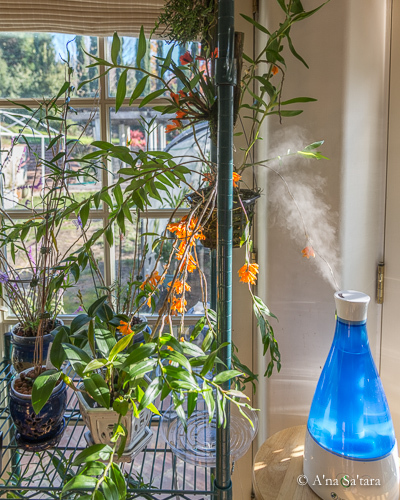 I purchased a second humidifier, placed it on a 30″ bar stool for adequate height, and directed the flow over the top of the hanging Dendrobium subclausum basket. The stream of humidity goes through the center of the space, keeping the highest humidity-loving mounts in near-constant mist, falling onto the potted orchids below. The lower part of the two tier shelf area stays about 60% humidity, with the higher area with mounts tapering down from 100% humidity. No, the paint doesn’t peel, there is no water on the hardwood floors, and mold is absent. When needed, I run the humidifier 24 hrs/day, on medium during the daytime and low at night. While there is a small area of “cloud”, it evaporates quite quickly due to the surrounding lower humidity so the plants stay in the 60-80% zone without damaging the house. During the worst weeks of fire weather here (60F days, 15%-20% humidity outside), the mounted Dendrobium vexilllarius were pushing out new canes and opening flowers. Need I say more? I had anticipated only using this setup during the summer and autumn, but have turned it on again in December with the unusually warm, dry weather. I use the prevailing humidity as my guide — when it drops below 60%, then I turn on the directional humidifier for as long as needed (and often off at night). In the driest conditions, I also run the larger room humidifier to expand the beneficial area. While the directional humidifier is very effective, it raises humidity to high levels only in a 2’x2′ area. Combined with the other humidifier, I can maintain over six feet of shelf space in very optimal conditions. 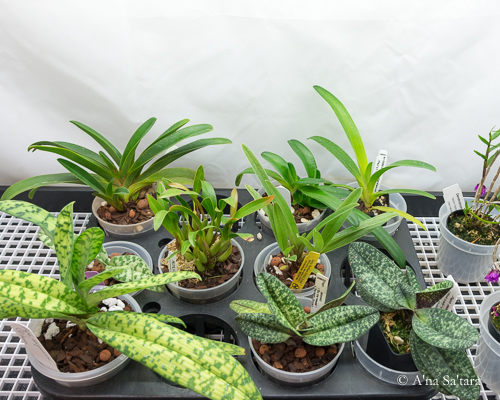 Humidity trays are a very popular solution for orchid growing, and I wonder how many of the people who sell or recommend them actually use them? And test them? 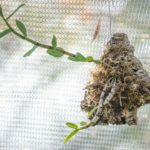 In abstract, it should be apparent that they can only increase humidity in a very small area before it mixes with the drier air of the rest of the room. Look at the photo above of the humidifier — it is actively pumping out about a quart of water in 8 hours and the humidity only substantially increases in a four square foot space. That being said, I have found humidity trays to be effective in two situations: 1) a small enclosed space and 2) for short orchids. The first use is in my little “warm” growing area, which is two 48″ long shelves enclosed in plastic with a velcro front opening. Under the lights, the water on the black trays constantly evaporates and raises the humidity 5-15%. But you know what makes a bigger difference? How recently the orchids have been watered. Many of the Phalaenopsis are potted in sphagnum moss. Freshly watered, the humidity raises notably. As they dry out, the humidity in the area drops by at least 10-15%. When I see the humidity is low on a shelf, the first thing that I do is stick a finger in the top of the pots — almost always, the top moss is getting dry. In an unenclosed space, I have not been able to measure an increase in humidity in the larger room environment, even with multiple trays. However, the relative humidity does increase by about 10% in the six inches above the tray (I’ve placed humidity meters at different heights above the tray). This makes the humidity tray ideal for short orchids and I’ve used it for small paphiopedilums and seedlings. 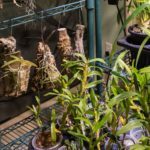 I hope these successful trials can improve your orchid culture — as well as save you time and money on what doesn’t produce tangible results. The size of area, and how much supplemental humidity is needed, can be compensated for with more humidifiers. Depending on the environment at the time, I run 0-4 humidifiers in the main indoor growing area.